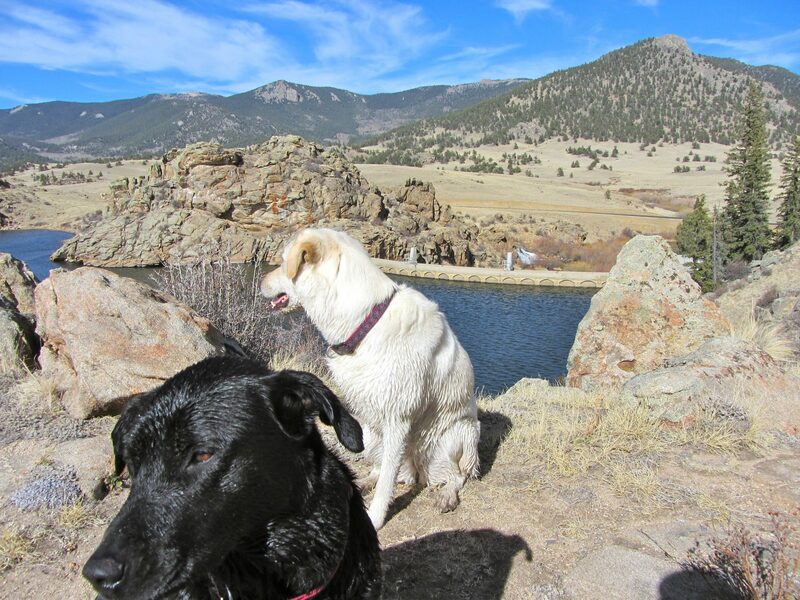 With a forecast of mid-90s on Sunday I took the dogs up to Boreas Pass. We set out fairly early and were up on the hill by 9 AM. The road over Boreas Pass connects Como withe Breckenridge southwest of Denver. The Denver, South Park And Pacific narrow gauge railroad routed over this pass to facilitate access to gold rush prospectors. A scenic roadway runs over the pass now on the same route and is a popular summer drive for people in both the Denver and Breck/Vail areas. There is actually a small section of the original tracks that have been preserved at Rocky Point. By the time we arrived there were already many people at the visitor center at the pass. I decided not to park there and proceed further over the pass toward the Breck side. I found a pull -off and parked next to a forest trail. The girls and I followed the trail downhill for about three miles before deciding to head back to the truck. We passed several open fields of wild flowers and a small stream which provided relief to Lucy and Fabi. We managed to rack up almost six miles on the round trip before heading back down to the front range for the afternoon.